For their study, published Tuesday in the journal Frontiers in Sustainable Food Systems, researchers from the Oxford Martin School compared the potential impact on the global temperature over the next 1,000 years of three cattle farming methods and four potential methods for growing meat in the lab. Their comparison revealed that yes, lab-grown meat could be better for the environment — but it won’t be better by default. The methane emitted by cattle also has a different kind of impact on the environment than the carbon dioxide that scientists might pump into the atmosphere while producing meat in the lab. 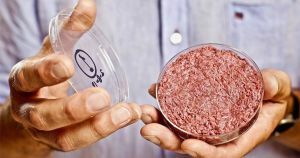 Ultimately, this research reveals that it’s still too soon to know whether lab-grown meat could actually solve our agriculture-caused climate woes — which means we might still be headed toward a future in which we need to trade at least some of our steaks for salads. The post Lab-Grown Meat Could Be Worse for the Environment appeared first on Futurism. This entry was posted in Spirituality by admin. Bookmark the permalink.